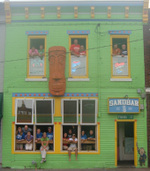 Sandbar Hurricane Video #2 - The Sandbar...Home of the Indoor Hurricane! Our first hurricane video ran for awhile, and then we moved up in the world and hired the local TV station to create our next one back in 2002. Our stars moseyed down the street to Channel 6 studios and tried to be professional. We probably failed miserably, but we had fun doing it. At least we didn't get kicked out of the studio. Pat Mushrush as our "man on the street"
Warning: this video is LONG. It featured our original hurricane song at the end- a revised version of Copa Cabana, sung by Scott "Showtime" Schoenberger, Peach, and Larry Hofmeier. While loading this video, we discovered a hidden track-our revised version of Love Shack that rolls during the credits, along with a few bloopers. This song didn't stick around very long, so many of you might not remember it, or maybe you never even heard it. Frankly, we forgot about it and were pleasantly surprised we still had a recording of it. Get ready, Lawrence- this is going to be a BIGGER one!